Sports photography probably has to be one of the most difficult photography niches to date. This is especially true if you want to capture images during your own physical sports activities, because maneuvering difficult challenges while trying to capture the perfect shot all at the same time can be pretty demanding on the body. Fortunately, there are lots of great sports and action cameras on the market today. Because they are so trendy and popular, sports cameras have satiated the market. With literally thousands of different models from hundreds of brands to choose from, it can be a challenge to find the best one for your needs and preferences. So if you’re in search of the best cameras for sports photography but you’re not quite sure where to start, check out these 5 top picks to set you off in the right direction. One of the best sports cameras on the market is the EK7000 4K WiFi Sports and Action Camera from Akaso. Boasting a complete roster of functions and features that make it a premium camera choice, the EK7000 is definitely an investment you would want to make. The robust build and the professional quality outcomes it produces make it a great choice for those who constantly find themselves in the heat of high intensity action and sports. The device boasts 4K video capacity, allowing you to produce high quality video captures that can make viewers feel like they’re right there where the action is happening. The device can also take impressively crisp, clear, and brightly colored captures at 30 frames per second, so you don’t miss a moment. This makes it a lot easier to capture those split second moments that are hard to shoot when you’re working on a slower FPS rate. Finally, the device also comes with a wrist remote control that enables users to leverage the camera without having to hold it in their hand. This means you can keep your focus on what you’re doing without having to worry about whether or not your camera is capturing the moments you want to cement in history. Capable of capturing 4K video quality which enables users to produce professional grade video recordings with ease. Continuous still image capture at 30 frames per second means you’ll never have to worry about missing a single moment. Comes with an easy and convenient wrist remote control that lets you manage your camera without having to actually hold it. Robust and durable, withstanding falls and trauma so you can confidently use it in a variety of demanding shooting and sports conditions. Reasonably priced, especially when you compare it to a lot of the other sports cameras on the market. May produce some whirring noise which can interfere with the audio of video captures. If you’re looking for something that’s extra affordable, then the Drograce WP350 Sports DV Camera is the right one for you. This device comes at a much lower cost compared to other sports cameras on the market, but it does offer some pretty sweet functionality that will give you impressive results nonetheless. The versatile camera features a number of different settings and options that extend its functions, making it a close contender for even some of the most well-known sports camera brands available. Firstly, the Drograce WP350 is completely waterproof, allowing you to take it to a variety of shooting locations without having to think about water or moisture damage. This also enables users to leverage the device under water, making it possible to capture scenery from underwater dives and snorkeling. 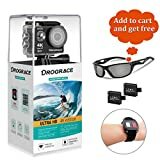 Some other features that make the Drograce WP350 Sports Camera a great choice include its 4K video capture capabilities, built in WiFi connectivity, Sony brand CMOS sensor for premium quality images, and its versatile design which allows users to mount the device on a variety of accessories for extended functionality and use. Versatile design lets you mount the device on helmets, wrist bands, bikes, and a variety of other accessories and equipment to switch up your perspective and give you access to more possibilities. Uses a Sony brand sensor which promises high quality images and video that competes closely with the output that other, branded options provide. Capable of capturing 4K video for premium quality video recordings. WiFi connectivity makes it easy to share and save captures for seamless file management and transfers. Impressive after sales service lets you get the best support once you receive your device. Battery life could use some improvement. 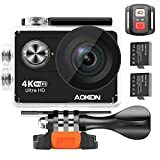 Lots of different action cameras on the market promise impressive results, but because they can come in very limited bundles and sets, it can be hard to get exactly what you want without having to spend extra on accessories and attachments. That’s why the Aokon 4K Action Camera ARC100 has become such a huge hit. The device comes in a very complete bundle that makes sure you get everything you need out of your action camera without having to spend extra on accessories. 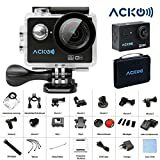 So when you buy the Aokon Action Camera, you don’t only get the device itself but also a number of other items including a waterproof case, helmet seat, bandages, a charger, stickers, tethers, a wire rope, a USB cable, a lens cloth, and a user manual. This makes the entire purchase much more complete, so you don’t need to go out of you way to purchase any extras that could weigh down on the total cost you spend. What’s more, the Aokon 4K Action Camera does pretty well in terms of capture quality. Able to generate images and videos that closely compete with other branded sports cameras on the market, this device is also a great choice if you’re in the market for a choice that’s easy and efficient to use. Comes in a complete bundle package, so you don’t need to think about buying extra accessories and compound the cost. Offers a number of great features that make the device both easy to use and multifunctional to suit your ever changing activities. Competes with other branded sports cameras in terms of capture quality and ease of use. Robust build makes it a great companion for everyday use. Doesn’t perform too well in dim lighting, so it might not be a great choice if you plan to use it during the night time. Featuring some of the most powerful capabilities in the sports camera industry, the DBPower N5 4k Action Camera is the choice if you want something that maximizes the quality of your output. For instance, the N5 boasts an optical zoom capability that reaches up to 5x the original image size which is a lot more extensive than other action cameras on the market. This enables users to close in on distant subjects without having to move from where they’re standing. 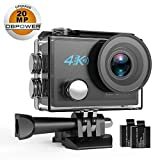 Some other features that make the DBPower N5 4K action camera a great pick include its high resolution video capture capabilities and its 20 megapixel Sony branded CMOS sensor. These features come together to make it possible for the DBPower N5 4K Action Camera to generate ultra crisp, clear, and distortion free images and videos that are perfect for travelers, athletes, and outdoor enthusiasts. While it is a really impressive device, there are a few downsides to the device. The first is that it isn’t technically the most durable device there is. So users might need to exert extra care and caution when using it. Secondly, it’s also not that easy to set up even with the help of the user manual which tends to be a little confusing for most buyers. Lots of features and functions that aren’t available with other action and sports cameras on the market. Features a 20 megapixel CMOS sensor from Sony which makes the quality of the device’s captures at par with other more expensive cameras from well known brands. Includes a number of different accessories that make the camera much more functional. Not technically the most durable choice on the market, so this may be an issue for users who want to be able to leverage it for extreme sports. Set up is confusing and tedious. The last option on our list of the best cameras for sports photography is the Acko 4K WiFi Sports Action Camcorder. This device features yet another complete bundle, coming with a number of different accessories and attachments that give you greater value for your money. So if you’re in search of an affordable, all-in-one choice that maximizes your money’s worth, this one is the right device for you. Much like the other cameras on our list, the Acko 4K WiFi Sports Camera is also capable of full HD at 4K resolution. This makes it perfect for capturing sceneries and activities that you might engage in while you’re out and about during your sporting activities. The device is also capable of taking high quality still images at 30 frames per second, so you can be sure to get every last moment on camera without having to worry about whether or not you missed a good shot. The reasons why this choice didn’t make it too high up on our list is the fact that it doesn’t have too impressive of a battery life and some of its accessories aren’t built to withstand daily wear and tear. Nonetheless, it can be a great pick if you’re particularly careful of your camera when you use it. Comes as a complete bundle with a number of accessories and attachments perfect for those in search of a solid bargain. Capable of producing high resolution video and image captures at 4K for superior image quality and clarity. Continuous capture at 30 frames per second promises that you won’t have to worry about missing those glorious moments during your activities. Battery life isn’t the best there is. Some accessories can give in to wear and tear over just a short period of time. Still not sure which sports camera you should invest in? It can be a tough choice. With so many different options on the market, it might be difficult to sift through their qualities to find a model that truly fits your preferences and needs. So if you’re still not quite certain which sports camera really meets your standards, be sure to check out the ones on our list. 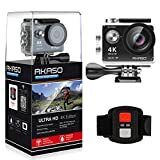 These 5 top rated sports and action cameras are the best there are and are guaranteed to give you the best value for your money all while offering you superior functionality like no other. The Best Lens For Sports Photography With A Sony A6000 Camera! The 5 Best Camera Straps for DSLR Cameras On The Market!